Exterior radial multipole magnetising fixtures are designed to produce a multipole radial field on the external diameter of a ring magnet or magnet assembly such as a permanent magnet rotor. They are optimised to produce a sharp a pole transition as possible within the constraints of the magnet size or pole number. The big advantages are that permanent magnet rotors can be assembled un-magnetised avoiding safety and issues with the handling high energy magnets, and significantly reducing assembly times. 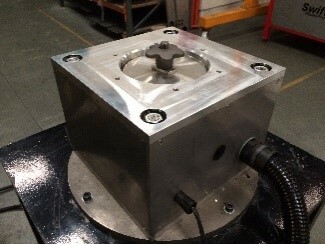 Multipole fixtures can be used on permanent magnet rotors that are sleeved, or constructed from either anisotropic or isotropic magnets, sintered radial rings or pre-aligned segments.